Prairie Dog boring machines are built to do a common job at the lowest cost. Keeping it simple. Directional rigs require large crews to operate, transport and maintain the machine. Typically a two man crew can do it all with a Prairie Dog and the machine will fit in a pickup truck. Most utility bores don’t need an HDD rig. Most contractors that own HDD rigs don’t want to do these small jobs or will charge a fortune to do it because the transportation and set up costs are high. Once they do the job you are usually left with two ends of pipe or cable sticking up out of the ground leaving you to have to go out and dig down to the tie in anyway. Do it all at once with a Prairie Dog. We build our machines with low cost of ownership, operation and maintenance in mind. We use quality components like Honda engines and manufacture many of the parts right in our plant, here in Houston, in order to ensure that the quality meets our standards. Our machines are built to stand up to the elements. They are easy to work on and parts, when you do need them, are easy to get. Some of our customers are still using 30 year old machines. How’s that for ROI? Great customer service from Bill, we have had pretty good success with our 1200 TW boring machine since we purchased it in 2009. Bill is always very professional and helpful when we call. We will continue to do business with your company. Thank You. Boring with a Prairie Dog machine is not only easy it’s predictable. Most customers simply don’t believe our machines can do what we say. You can count on being able to hit your target even if you hit something in between. Missiles can’t do that. As soon as they hit something they will veer off course and usually come out in the worse possible place like the middle of the road if they come out at all. For less than what you would pay for a missile and air compressor you can own a Prairie Dog and hit that mark every time. In addition, our machines will work in a wide range of soil conditions and allow you to bore multiple sized holes. Missiles simply can’t do that. They aren’t designed to. Prairie Dog Boring Equipment is introducing the new 500TWG. 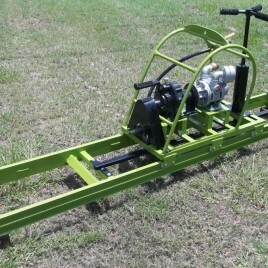 Similar to the 500TW the new model is only 5 1/2 feet long and uses 2 1/2 foot long drill rods. The machine will fit in the same size pit as most missiles or bullet moles but has larger capacity(up to 6″), and will work in a variety soil conditions with much better accuracy and higher productivity rates. The cost is very competitive just for the machine itself and there is no need for an air compressor. All you need is a municipal type pressure water supply. It’s great for tighter areas where a full size bore pit isn’t possible. We have machines in use all over the country and on 6 continents by municipalities, water and sewer districts and contractors installing all kinds of underground utilities. They are in rental fleets as well because the simple design and ease of operation make them a great rental item. Check with us for rental companies that might have them in your area or encourage your local rental store to look into a Prairie Dog machine. I have purchased two machines from Bill at Prairie dog and have had nothing but great service. Our machines have stood up to a variety of difficult material to bore through and are still getting the job done. Thank you for your service and your product.